All three stories feature the same three main characters, Little Duck, Big Duck and Porcupine. 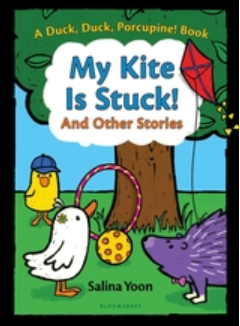 In the first story, Big Duck gets his kite stuck in the tree. His two friends try to help, but only make the problem worse. Children will laugh at the silly solutions the characters invent. The second tale revolves around Porcupine making friends with a bug. Big Duck and Little Duck discuss the qualities needed in a friend and try to persuade Porcupine why he can’t be friends with a bug. There is a surprise ending. In the third story, the three friends decide to build a lemonade stand. They model cooperation, patience and hard work. Of course, there are a few hiccups and lots of humor when the friends forget about the main ingredient needed for their success. These stories employ speech balloons with dark text and brilliant digital illustrations that fill the page. I would recommend it to preschoolers and kindergarten beginning readers. Each story can be enjoyed separately for beginning readers with shorter attention spans. What a charming way to combine science, a bit of magic and a strong female role model in an interesting story! Zoey is an inquisitive, intelligent, sweet girl. One day she discovers her mother holding a photograph that appears to be glowing. Her mother attempts to hide it, but when Zoey reveals that she can see the glowing creature, her scientist-mother reveals her secret. As a child, her mother discovered a purple glowing frog that was severely injured. 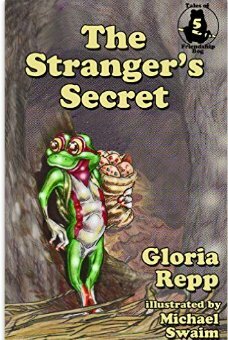 To her amazement, the frog named Pip began talking to her. Ever since that day, Zoey’s mom had been helping other magical creatures who needed assistance. She installed a hidden doorbell in the barn. Zoey’s mom thought she was the only one who had this ability, but now she understands that Zoey also has the gift. When Zoey’s mom must travel to a scientific conference, Zoey hopes that she will receive a call for help from one of these magical creatures. Zoey studies her mom’s journals, notes, and photos. Sure enough, a few days later, she hears the bell and finds a small reptile near death in the barn. Zoey gets to work, but there is so much to learn. She sets forth a hypothesis and sets out her materials. Like a true scientist, she uses trial and error and controls in her experiments. 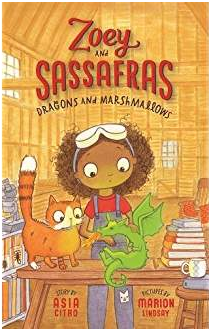 Together with her cat, Sassafras, they work to save the creature. Who is this creature? Will Zoey be successful? I found lots to like in this chapter book. Large print, beautiful black and white drawings, and a table of contents that lists the subject of each short chapter. Citro carefully crafts a multicultural, curious and hard-working female protagonist who is empathetic and appealing to young readers. Children quickly become engrossed with the plot, while hardly realizing they are learning about the scientific method and the reptile species. The glossary reinforces understanding of unfamiliar vocabulary. Highly recommended for beginning readers, but certainly challenging enough for middle-grade readers. If you enjoyed reading this post, please subscribe by clicking on the word Follow or by hitting the orange RSS FEED button in the upper right-hand corner of this page. This chapter book is part of a series, but Book 5 is a first time read for me. I had no difficulty following the tale as a stand alone story. Pibbin is a rather small young frog excited to be going on a work party for the first time. They need to repair Uncle Dip’s Bridge. Before Pibbin can begin the journey he meets up with an unconscious large frog named Riff who is clinging to a branch. With a mighty effort, Pibbin is able to rescue Riff because “Bog Keepers are good at helping strangers.” Riff has a large bump on his head and is carrying a large sack, but he cannot remember anything about the accident. Now Pibbin is torn between his feelings of responsibility to take care of Riff and to be part of the work team repairing the bridge. Readers meet lots of personified characters: a snake named Miss Green, squirrels, beaver, chipmunks and a clawed enemy named simply Cat. When the residents of Friendship Bog decided to exterminate the enemy, Pibbin and Riff fear they will never solve the mystery of his missing sister. It will turn out that lending a helping hand to friend or foe can be rewarded. Cooperation, moral support and friendship are the major themes tying the inhabitants of Friendship Bog together. Young readers learn the benefits of practicing these themes in everyday situations. If you enjoyed reading this post, please subscribe by clicking on the word Follow or by hitting the RSS FEED button in the upper right hand corner of this page. New series of books featuring a young boy named Billy and his collection of stuffed toys who live on the top of the wardrobe in his bedroom and are affectionately referred to as The Top of the Wardrobe Gang. Previous rhyming books in the series have featured their adventures in writing books for kids, which they turned to as a diversion to pass the time of day when their owner Billy went to school. In this new series, members of the gang will allow readers a glimpse into their daily diary entries. 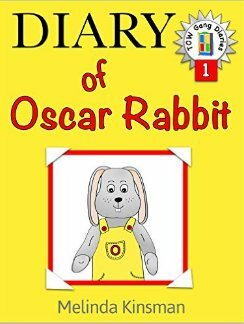 Oscar Rabbit narrates in the first adventure. He is upset that the gang’s writing schedule is going to be disrupted because a new swimming pool in town is about to open. Billy is really excited not only for himself, but especially for his cousin Ben because this new pool is accessible to the disabled. Ben is wheelchair bound. The Top of the Wardrobe Gang are determined to swim in the pool with their human friends. Oscar knows that stuffed animals will sink, but his friends refuse to be dissuaded. He writes in his diary about how Billy’s grandmother makes them all bathing suits and brings them cookies. Finally, opening day arrives. What will happen to the Gang? They seem determined to ignore the truth. This book is targeted for readers ages four through eight. Preschoolers will read through the clever illustrations. Beginning readers will enjoy story written in short paragraphs of text with just enough challenge, but not overwhelming for new readers. They will delight in the activities provided at the end: matching, mazes, simple math, and find the differences. An answer key is provided for self-checking. Wonderful value for the story entertainment and enrichment activities to extend learning. Highly recommended for young readers, teachers and parents. 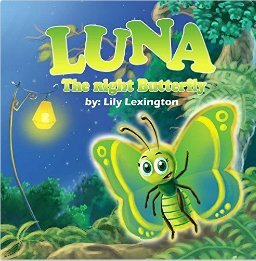 Luna is an emerald green butterfly who was different from all the other butterflies. While they invited her to play, Luna felt dull and listless in the light, but in the night she glowed and came alive. A wise old owl tells her the reason why; Luna is not a butterfly but a beautiful moth. Luna decides that it is fun being different and special. Targeted for preschoolers, some of stories are written in rhyme, and others in prose. All together totaling a little more than one hundred pages, the book is best read in sections as a bedtime story or as a circle time classroom discussion. Parents with children who are experiencing problems like the characters in the stories might choose and discuss one to help a child cope. I read this book on my kindle HD fire and did not experience the formatting problems that some reviewers mentioned. Recommended as a nice add on to a preschoolers library. If you enjoyed reading this post, please subscribe by clicking on the word Follow or by hitting the orange RSS FEED button in the upper right hand corner of this post. Food for Thought on Earth Day…..
Heartwood is a heartwarming story that takes places in The Linney, which is a magical forest filled with trees that are hundreds of years old. Four trees are featured characters: Seth, The Tully Tree, Kelsey, and Tuleah. Each of these trees is inhabited by a different type of creature. A family of thirteen squirrels live in the Seth tree. Magpies sip the nectar in the flowers of the Tully tree. Tiny fairies live in the Kelsey tree, while a single raven named Bella makes her home in Tuleah. All of these creatures had lived in their homes for many years, but sadly none of them spoke to each other. One day the peace of the forest is broken by a horrible noise. The creatures recognize it as a machine that knocks down trees. They call the bulldozer a “Smashbuster.” Forest inhabitants are in a panic about what to do, until Bella calls them together and warns them to stop quarreling if they intend to save their home from destruction. Bella berates them for their indifference and selfishness. She develops an ingenious plan to save the forest, but they must all agree to cooperate and work side by side. The author skillfully reveals the clever plan step by step. Both the forest creatures and the humans who operate the machines have a lot to learn. This book of approximately fifty-five pages is a perfect chapter book for readers in the seven to ten age group. That is not to say that older readers and even adults will enjoy it. The charming and delicate illustrations done by Chalmers add much to the character and mood of the book. They are really exquisite. I cannot find anything not to like in this offering. Story-line flows nicely, the characters are believable, the lessons carefully crafted , and the artistic touches so well executed. Pick up a kindle or paperback copy and enjoy! Mao Mao is an adorable panda bear who lives in a bamboo forest. She loves to play with her human friends who live in the village nearby. But the inhabitants of the village were fearful of the Nian who came out after dark to plunder their livestock and food. Once the sun set, the entire village barricaded themselves inside their homes. 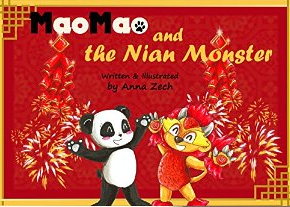 When Mao Mao’s grandma gives him some books to read, he discovers that monsters are afraid of loud noise, bright lights, and the color red. So Mao and his friends outfit the village with all three of these elements. Mao and his friends come upon Nian while playing in the forest one day. They find out that Nian is more like them than they thought. Will the villages and the Nian find a way to coexist after all? The simple text and beautifully done illustrations will assist preschoolers and primary school age children in understanding some of traditions involved in the celebrations of Chinese New Year. This book is an excellent choice for a teacher exploring multiculturalism or a parent’s bedtime story. 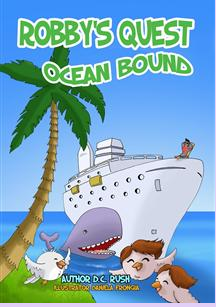 Robby’s Quest:Ocean Bound is the second book in the four book series featuring Robby as the protagonist and leader of a diverse flock of bird adventurers. I enjoyed this second chapter book even more than the first. It is more richly illustrated and the story flows seamlessly. The fourteen feathered friends have arrived in Arizona to which they fled after a hurricane destroyed their winter home in Florida. Lately, the weather has been getting quite warm so the birds have a conference and eventually vote to migrate further west to San Diego where they can take advantage of the cool ocean breezes and plentiful food supply. Ruby has been there with her last flock; she offers to serve as a guide. Less than a week later, the flock arrives in San Diego, where each group goes off to explore the sights. Two of the younger birds, a robin named Joy and her friend Josie, the sparrow, fly out to investigate a cruise ship, only to fall asleep and find themselves stranded at sea. Robby leads a group of six rescue birds in a search party. The reader follows the adventures of both groups. Will Joy and Josie ever rejoin their group of faithful friends? This early chapter book story contains endearing story characters and a well integrated plot with just the right amount of challenge for an early elementary school reader. Color illustrations are simple but add interest to the story. Qualities like friendship, team work, bravery, cooperation and loyalty are seen as valuable traits. The ending to this adventure involves a new discussion among the birds as to future plans. Will the friends remain together or find new adventures on their own? Stay tuned.